The developers of SneakPeek Photo offer another Quick Look plug-in, SneakPeek Pro, that may prove even more useful if you spend much of your time working with graphics and publishing files. SneakPeek Pro adds Quick Look support for Adobe Illustrator and InDesign documents and templates, Adobe Swatch Exchange documents, Adobe InDesign XML Interchange files, Freehand MX documents, and Encapsulated Postscript (EPS) files. Once the plug-in is installed, using Quick Look on any of these file types will show you a large preview of the file. (This works even if you’ve opted not to save your Illustrator documents with PDF compatibility—SneakPeek Pro can generate its preview from the actual file data.) Double-click on the preview to open the file. Like SneakPeek Photo, SneakPeek Pro shows you additional details about the file. At the top of the preview you’ll see the file name, type, and size, as well as the creation and modification dates and times. To the right is a useful list of all fonts, images, and color swatches used in the file. One limitation of SneakPeek Pro is that for some document types, it’s dependent upon the preview data saved within the file. For example, if you save your InDesign files with Small or Medium preview images, you’ll see a lower-resolution preview that may replace smaller font sizes with gray boxes. Saving your files with higher-quality previews avoids this and gives you the best Quick Look previews. Because Mac OS X’s Cover Flow feature takes advantage of Quick Look plug-ins, installing SneakPeek Pro also lets you browse high-quality previews of your graphics files in the Finder’s Cover Flow view. Similarly, SneakPeek Pro lets the OS display high-resolution previews within Open and Save dialogs, and in the Finder’s Column view. It’s a great OS add-on if you frequently work with these types of files. 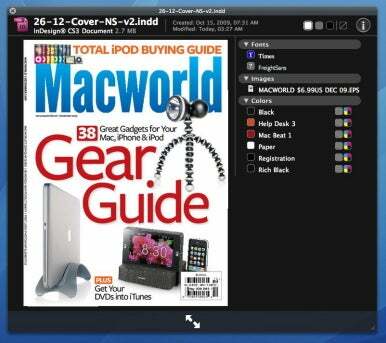 Macworld Art Director Rob Schultz graciously contributed to this article.